On a few occasions I have looked across the River Barrow to St Mullins monastic site, wishing I had the time to visit. So when we decided to tour around Carlow and Kilkenny, it was top of my list. 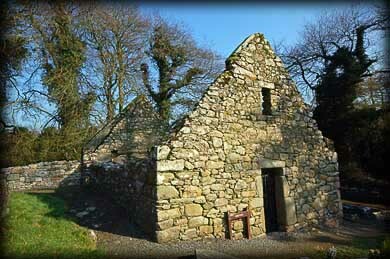 Tigh Moling is the place name in Irish meaning House of Moling. It is beautifully situated on the eastern bank of the Barrow, overlooked by both Mount Brandon and the Blackstairs Mountains. The drive down to here from Tinnahinch/Graiguenamanagh was just adorable, scenic countryside and gorgeous weather is a great combination for anyone touring. We stopped at nearby Templenaboe to whet our appetite. Wow! What a stunning entrance to a monastic site, situated on our right was a well preserved Norman Motte and Bailey and in the valley below to our left, St Moling's Holy Well. There is a pathway through the graveyard to the monastic buildings. The first one is a Church of Ireland Church built in 1811 now used as a Heritage Centre. In addition to an exhibition, which is open to the public, the Heritage Centre also welcomes genealogy queries relating to St. Mullins or the neighbouring parishes in Wexford and Kilkenny. The next building is the oldest church known as Teampall Mor a 15th century church, parts of which date to the 10th/11th century. A Nave and Chancel now remain. 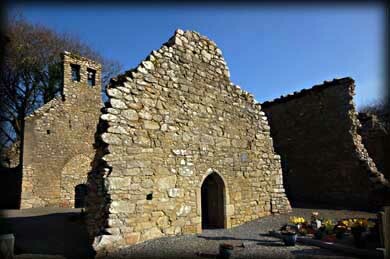 It is believed the walls of the original Nave extended beyond the gables forming antae. Adjacent to Temple Mor is an 11th century church known as the Abbey. An additional floor was added in the 15th century. In the Chancel are the original Altar and a sedilia. To the front right of the Abbey is the stump of a free standing 11th century round tower that was later attached to the Abbey. Beyond the Tower are two more buildings- one is sign-posted as an oratory the other a domestic building. 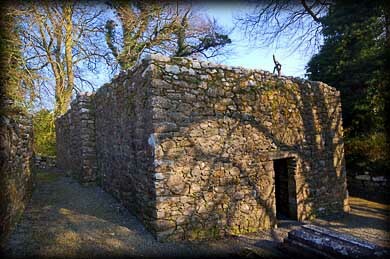 The oratory functions as a mausoleum for the Kavanagh family, descendants of the Kings of Leinster. 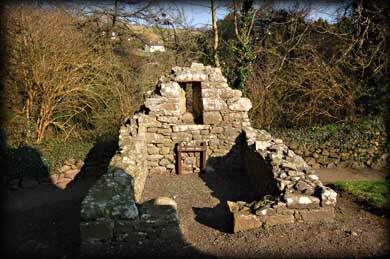 At the Back of the abbey, between there and Temple Mor is a small oratory measuring only 2.06 x 2.39 metres, dedicated to St James. 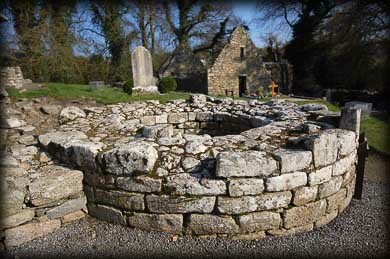 This may have been a tomb shrine to the founding saint as it is similar in size to Temple Ciarán at Clonmacnoise. 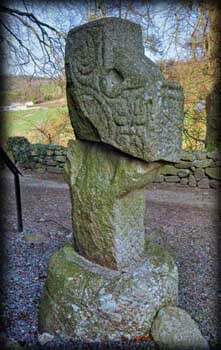 Near the oratory are the remains of a High Cross. This cross belongs to the Barrow Valley Group that includes those at Moone, Castledermot, Ullard and Graiguenamanagh. See High Cross section of website. We found St Mullins to be a very serene special place. St. Moling was born in 614 in Sliabh Luachra in Kerry. According to tradition he was a descended Catahair Már (a Prince of Leinster). 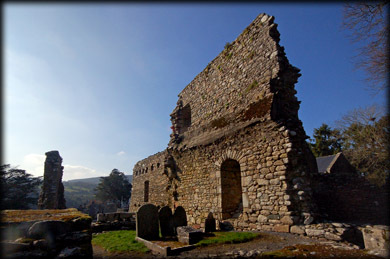 He studied to be a monk in Ferns, County Wexford and also as a monk at Glendalough. Under the patronage of Maedoc of Ferns he founded his monastery at Achad Cainigh, which became Teach Moling or St. Mullins in the 7th century. He was made Archbishop of Ferns in 691. During his lifetime many miracles were attributed to him. He dug a mile long watercourse with his own hands to power his mill, a task which took seven years. He is also attributed with freeing the people of Leinster from paying the Borumean Tribute ( See Templenaboe). 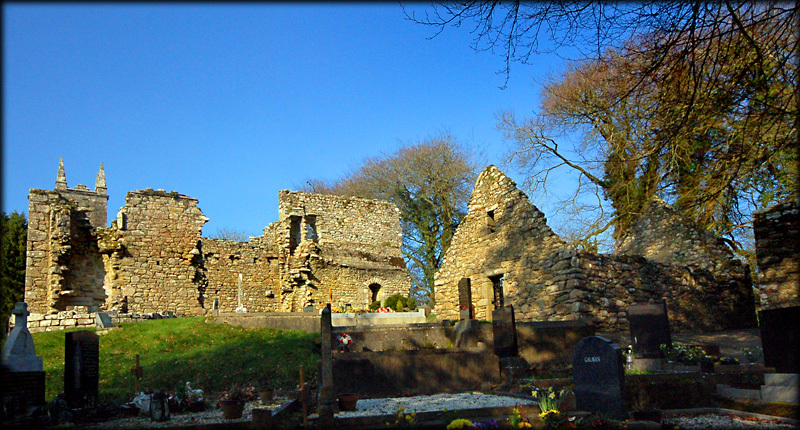 He died in c.696 and is believed to be buried in St. Mullins - there is a plaque in Temple Mór marking the spot. Situated: Another very easy site to find. From Graiguenamanagh drive across the Barrow to Tinnahinch, take the first right, sign-posted for St Mullins. It is about 6 kilometres down here. Don't forget to stop at Templenaboe on your left. Discovery Map 68: S 728 380. Last visit March 2011.